Wanted to take a quick peek at someone nearby? Wanted to reach for a drink, your phone or a keyboard? Needed to find a surface to set down your controllers? In the past you probably fumbled about or removed your headset, which can be clumsy if you have controllers in your hands. Starting with Windows 10 build 17723, Microsoft added the ability to peer into your physical environment through Flashlight – without removing your headset. You can open a portal into your real world at any time via the Start menu, a button shortcut, or a voice command. This opens a low-latency pass-through camera feed connected to your controller. It’s comfortable, intuitive, and keeps you immersed. 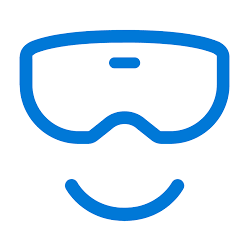 This tutorial will show you how to open and use Flashlight in Windows Mixed Reality to peer into your physical environment on your Windows 10 PC. This option requires having speech recognition turn on in Windows Mixed Reality. 1. While using the Mixed Reality Portal app for mixed reality, say the voice command below you want to use.